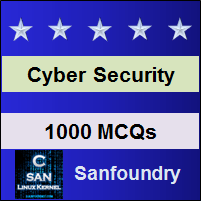 This set of Cyber Security Multiple Choice Questions & Answers (MCQs) focuses on “OSI Model Security – 1”. 1. The ____________ model is 7-layer architecture where each layer is having some specific functionality to perform. Explanation: The OSI model is 7-layer architecture where each layer is having some specific functionality to perform. All these layers work in collaboration for transmitting the data from 1 person to another worldwide. 3. Which of the following is not physical layer vulnerability? Explanation: Unauthorized network access is not an example of physical layer vulnerability. The rest three – Physical theft of data & hardware, damage or destruction of data & hardware and keystroke & Other Input Logging are physical layer vulnerabilities. 4. In __________________ layer, vulnerabilities are directly associated with physical access to networks and hardware. Explanation: In the physical layer, vulnerabilities are directly associated with physical access to networks and hardware such as unauthorised network access, damage or destruction of data & hardware and keystroke & Other Input Logging. 5. Loss of power and unauthorized change in the functional unit of hardware comes under problems and issues of the physical layer. Explanation: Loss of power and unauthorized change in the functional unit of hardware comes under problems and issues of the physical layer. Other such issues are unauthorised network access, damage or destruction of data & hardware and keystroke & Other Input Logging. 6. Which of the following is not a vulnerability of the data-link layer? Explanation: MAC Address Spoofing, VLAN circumvention and switches may be forced for flooding traffic to all VLAN ports are examples of data-link layer vulnerability. 7. ____________ is data-link layer vulnerability where stations are forced to make direct communication with another station by evading logical controls. Explanation: VLAN Circumvention is data-link layer vulnerability where stations are forced to make direct communication with another station by evading logical controls implemented using subnets and firewalls. 8. ________________may be forced for flooding traffic to all VLAN ports allowing interception of data through any device that is connected to a VLAN. Explanation: Switches may be forced for flooding traffic to all VLAN ports allowing interception of data through any device that are connected to a VLAN. It is a vulnerability of data link layer. 9. Which of the following is not a vulnerability of the network layer? Explanation: Weak or non-existent authentication is a vulnerability of the session layer. Route spoofing, identity & resource ID vulnerability & IP Address Spoofing are examples of network layer vulnerability. 10. Which of the following is an example of physical layer vulnerability? Explanation: Physical theft of data is an example of physical layer vulnerability. Other such issues are unauthorized network access, damage or destruction of data & hardware and keystroke & Other Input Logging. 11. Which of the following is an example of data-link layer vulnerability? Explanation: MAC Address spoofing is an example of data-link layer vulnerability. VLAN circumvention, as well as switches, may be forced for flooding traffic to all VLAN ports are some other examples of data-link layer vulnerability. 12. Which of the following is an example of network layer vulnerability? Explanation: Route spoofing is an example of network layer vulnerability. Other examples of network layer vulnerabilities are IP Address Spoofing and Identity & Resource ID Vulnerability. 13. Which of the following is an example of physical layer vulnerability? Explanation: Keystroke & other input logging is an example of physical layer vulnerability. Other such physical layer vulnerabilities are unauthorized network access, damage or destruction of data & hardware and keystroke & Other Input Logging. 14. Which of the following is an example of data-link layer vulnerability? Explanation: VLAN circumvention is an example of data-link layer vulnerability. MAC Address Spoofing, as well as switches, may be forced for flooding traffic to all VLAN ports are some other examples of data-link layer vulnerability.